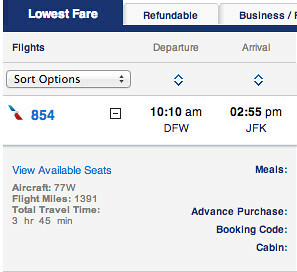 If you’re planning to travel to New York on May 8 then you might want to fly into JFK on American Airlines flight 854. 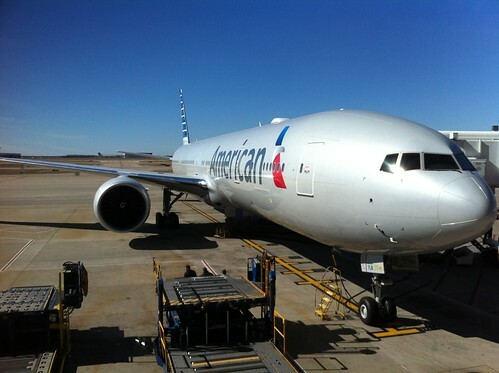 American is planning to swap out the Boeing 737 that they normally operate on that route with a new Boeing 777-300ER. According to Airline Routes, it’s a one way flight and a one-time event, the return flight that same day is scheduled to be operated by a 777-200. It’s no coincidence that May 8 also happens to be the day that American will start operating their second 777-300ER route between JFK and London when AA 107 gets upgraded from a 777-200. Even though the 777-300ER is configured with three cabins, the DFW to JFK flight is being operated as a two class flight. First Class is sold out, so there’s no chance of riding up front. But “Economy” might not be so bad. The new 777-300ER offers four kinds of seating: First, Business, Main Cabin Extra, and Main Cabin. 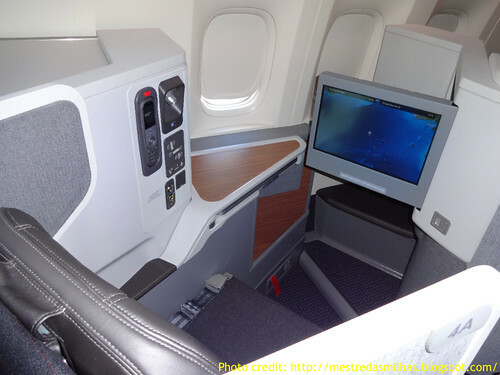 For the DFW to JFK flight the Business Class cabin is being sold as Economy, and if you have AAdvantage Elite status (or pay full fare) you can reserve one of the new Business Class seats. Even though you won’t get meal service, you will get a chance to check out the new Business Class seat and play around with the new entertainment system….it’s a lot nicer than Main Cabin Extra on a 737! Except for First Class, the flight is pretty wide open. If you’re planning to go to New York on May 8, then flying into JFK is worth considering. Also, if you’re traveling to Boston on the 8th, you might think about pricing a DFW-JFK-BOS segment, American offers connecting service to Boston out of JFK. Keep in mind that flight schedules change all the time, so you might be disappointed if you buy a ticket simply ride on the new plane. Should be good op for DFW folks as 10:10am departure is too early to connect from west coast. @ eponymous coward – Oh yeah, 3 X 4 X 3 is awful! @ pssteve – You’re right. It’s expensive out of DFW that day, but pretty cheap flight for folks originating from AUS or OKC. True…though AA should be happy to re-book you or even provide a refund if they change schedules/planes. Just be sure to book your entire roundtrip on the same AA reservation to protect yourself completely. The seat map you posted seems to show the business seats available to anyone, not just preferred. @ Jon – If they change the schedule they’ll usually give you a refund, but I’ve had them swap aircraft on me and refuse to move me to another flight without a change fee. The condition of carriage allows them to substitute aircraft. @ John777 – I was logged in when I made the screenshot, so I tried making a reservation without status and it wouldn’t let me book a seat in the biz cabin (not even for a fee!). 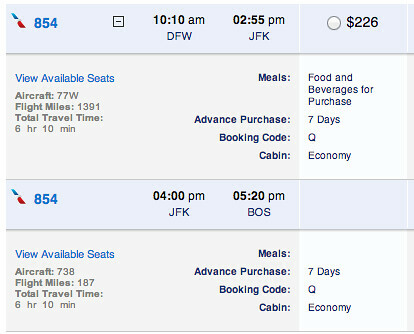 @ David – You’re right, the DFW to JFK fare is pricey! It’s almost cheaper to fly to London and burn the EVIP! Just booked BOS/DFW/JFK/BOS. Seat 4A. See you May 8th! Check your reservation. 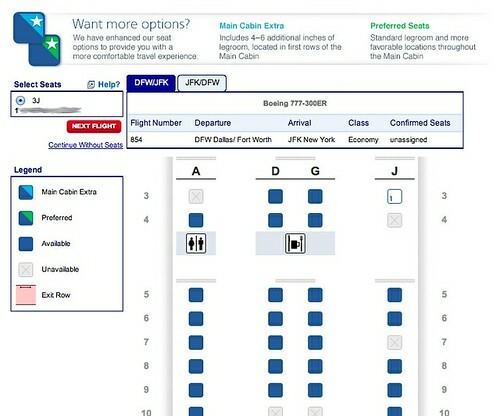 Mine shows “seat unassigned” and aacargo.com shows AA854 is now a 777-200! Time to get a refund! Thanks for the heads-up on this! I’ve needed to take a trip to DFW from NYC for a while. It’s always expensive on AA, and I’d been considering flying to AUS and driving to save the $100. Flying a new 777 in biz was just the excuse I needed to swallow the fare. Thanks again. I’ll be in seat 10A and in the Admiral’s Club before the flight. Sorry for the last minute notice, but if anyone would like to join me in the Admiral’s Club, I can bring in two. I’m planning to be at DFW Terminal C around 8:30 CDT. Leave a message here. Otherwise, I’ll see you on the flight.